Roundhay parkrun number 158 – Valley Strider Takeover Joy! A big thank you to the Roundhay parkrun team for allowing Valley Striders to ‘take over’ last weekend. We all had a marvelous time, the sun shone and we very nearly saw a record turnout, what a wonderful morning it was! Having been given the opportunity to write the run report, I thought I’d start with something that actually made me jump up and down! I was absolutely delighted to see our junior 2nd claim runner Alex Pagdin cross the finish line in a Valley Strider vest with a new PB of 17:45. Alex is just 15 years old and has been representing Valley Striders in some of the winter cross country races and more recently, been running with our Thursday night group. It’s encouraging to see that Alex’s stamina is improving and he’s now running stronger and faster, the PBs keep appearing and it’s exciting to see that he’s going to become an exceptional senior runner. Well done, Alex! The Valley Strider joy continued as first lady Myra Jones crossed the line in 10th place, knocking 38 seconds off her previous PB to run 19:09. Running without a watch she said she thought she’d ran ‘‘about 19:40’’. This new PB now ranks Myra as the 3rd fastest lady to have ever ran at Roundhay parkrun and we couldn't be happier for her, another outstanding achievement as she nears the end of her training for the Windermere marathon next weekend. Well done, Myra! We were lucky enough to be able to field quite a few runners on Saturday and from a review of the results it really was a week for PBs, with 14 Valley Striders running faster than they have before. We further recorded 276 finishers in total and a huge 77 new PBs across the field! It was also a week for some parkrun tourists amongst an encouraging 42 new runners! At the other end of the parkun spectrum, we had Tim Pocock & Alan Bracken who both completed their 99th runs and will soon join the 100 Club and be granted one of those coveted black t-shirts. Moving onto the younger amongst us, we’re very proud of all our junior runners at Valley Striders and we’d like to give a special mention and congratulations to Tally (age 10) who was the 15th female to cross the line with a new PB of 24:02. Tally is a regular at the junior parkrun events, she regularly runs at Temple Newsham parkrun and she just keeps getting quicker and quicker as the weeks go by. Another brilliant run, Tally! Also running were older brothers Jordon who secured a new PB of 27:42 and Stephen who ran 22:31 on his first time at Roundhay. We were also thrilled to see another of our junior runners, Callum Parton, knock 7 seconds off his PB to record a new time of 20:05. Callum is just 15 years old & another one that’s showing promising signs of things to come! I’ve also noticed a few PB flurries recently and one of those belong to none other than the lovely Becky Fishburn who knocked another 19 seconds off her PB to run 20:57. Becky, I’m going to have to admit defeat now, I can no longer validly call you my parkrun nemesis! Really really well done! So, a huge well done to everyone that ran, if it was your first, your 100th, a PB, or just a fun way of starting your Saturday! A big thank you to you all for supporting the event! Finally, as I've been given this opportunity, I’d like to personally thank the regular parkrun team for all the time and effort they volunteer every single week. Those that know me will know I'm a bit of a parkrun geek and despite the #hillofdoom I really do think that it is one of the best things happening in the UK right now. It is because of people like Graham and Becky and all the other wonderful volunteers that we’re so lucky to have such a great event on our doorstep and of course, more widely available across the country too – thank you so much! 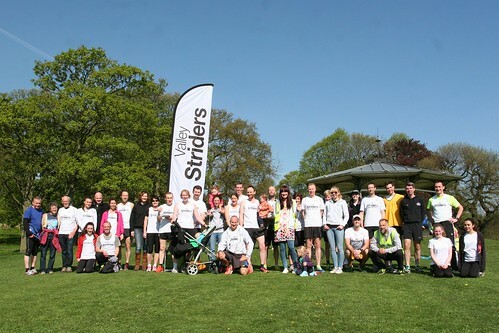 And, on behalf of Valley Striders, I’d like to reinforce the thanks to everyone that makes the run possible each week, we’re very grateful as a club and would like to continue to offer our support as much as we are able. #parkrunyourlife. I look forward to seeing everyone again when Valley Striders return on mass for the Roundhay parkrun Mob Run on May 17th! Eekk! We are delighted to announce that Rebecca Fishburn was the April recipient of our monthly prize, generously supported by Sweatshop. Becky's prize is a free pair of running shoes fitted out at her local Sweatshop store. Becky has been parkrunning since September 2012, and has improved her time by nearly 3 minutes since then. She is of course a stalwart volunteer too. We hope that her new shoes will help keep the progress going, or at least make the training sessions a little easier. And of course, what is fast becoming part of a national institution for the Britain, like every weekend – come rain or shine – on March 22nd 2014 parkrun was ready with open arms to welcome runners old and new to one of Leeds’ most beautiful parks. This week was slightly different from other weeks as the volunteering roles had been taken on by local club Chapel Allerton Runners. Not only were all roles filled – and possibly the best marshal ever cheered runners on from playground corner – but Chapel Allerton broke with the cake tradition to give all runners a lovely juicy orange at the end of their run. Super! In spite of the icy wind, 225 hardy runners crossed the finish line at Roundhay this week, out of which 39 were running at Roundhay for the first time – and a whopping 22 of those were parkrunning for the first time ever! Wow! Well done and welcome! The weather must have been good for running as 43 runners recorded new pbs – 20% of the whole field of runners. There are a few notable pbs amongst those – Roddy MacSween has managed to bag 3 pbs in a row; as have Nick Wilson, Simon Dixon and Liz McCarthy. Martin Brown has also bagged his third pb in a row, this time managing to break the 25 minute barrier. Richard Gibbs has finally broken 21 minutes, knocking a massive 15 seconds off to take him to 20:45. You spend all that time waiting and then two come along at once – Becky Fishburn has recorded her second pb in a row having waited a whole year to go sub-22. Tom Bamber also had a run of note where he has knocked a minute and a half off his previous pb to bring him to 22:50. Zelda Holiday has successfully dipped under 30 minutes for the first time and the pb machine Paul Stokes also needs a mention for his amazing 8th pb in a row! Well done all! This week the first across this line was James Smith from Leeds City AC. 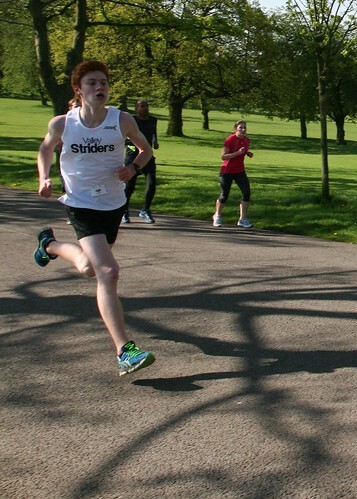 Having not run at Roundhay for a year, James still managed to smash out an amazing 16:38. For his first visit to Roundhay, Lee Sutcliffe from STAC managed a storming run, coming in second with a fantastic time of 17:59. Just behind, so in third, this week was Alex Llewelyn Jones in 18:10. Well done to the gents! For the ladies this week, Nicola Gabbutt led the field, crossing the line in 21:27 and bagging a new pb in the process. Becky Fishburn from Leeds & Bradford Tri came in second with a stonking 21:46. Our third lady this week was Louise Cazan in 22:25 – interestingly another ladies’ pb. Well done all three! Finally, Paul Crossan from Chapel Allerton offered to donate £1 to Sport Relief for each runner that managed to beat his ‘warm up jog’ of 22:30. This meant that Paul made a generous donation of £39 to sport relief following Saturday’s run so thank you Paul and well done to all runners that managed to beat that target. Next week we expect some interesting attire as some local runners (Chapel Allerton just can’t keep away!) don some posh frocks to celebrate the wedding of parkrunner Lora Hughes. Join in by sticking on a tiara! On May 17th Roundhay parkrun is hosting a mob run. This Club v Club friendly challenge that started at Leeds parkrun sees how many runners each club can turn out at a single parkrun – the higher the better. Also, it’s not just about the quantity as the average time will also be worked out for each club, making one the ‘fastest’ around. Found at all about it here. It’s just 4 weeks until Roundhay parkrun celebrates its 3rd birthday. I’m not promising cake, but I wouldn’t be surprised if there was some.... There will be prizes for top male and female runners as well as on-the-day spot prizes E.g. a pair of socks for finishing in position #50, a water bottle for best sprint finish etc. If you would like to donate a prize at all then e-mail or please bring something along on the day. As always, thanks go out to all volunteers and participants in Roundhay parkrun. If you can help out at all then please do get in touch! We are always looking for all sorts of volunteers and full training will be given on every task (not that any of them are difficult!) If you think you might be available, please have a little look at the future roster or at the volunteering page on the parkrun website. Keep running folks! See you at the next one! It was another cracking morning in Roundhay, a bit chilly but no ice. Amongst the 160 runners taking part there were over 20 new runners to parkrun and 7 visitors to Roundhay. We always welcome new runners and hope you enjoyed the event. 48 runners achieved a PB this week – a great achievement for all concerned. The winning male was Ian Furlong with a PB of 18:10. The winning lady was a Roundhay first timer, Jessica Learmonth, with a time of 20.02. Darren Duckworth celebrated his fiftieth Parkrun at Roundhay with a new PB of 27:41. Congratulations. Sean Sexton and Ella Maffey earned their 10 run tee shirts today too. There was a full complement of volunteers and they gave lots of welcome support and encouragement to the runners. Becky Fishburn was a brilliant Director on her first event. Thanks to all involved. Parkrun simply can’t happen without volunteers. If you can volunteer in the next three months please drop an email to roundhayhelpers@parkrun.com or sign up after the next Parkrun. We will be celebrating Roundhay Parkrun’s second birthday on 20 April so put this date in your diary. We will have an update soon on post run coffee. Another fantastic week for Roundhay Parkrun. We had 23 new runners to Roundhay among the 177 runners taking part. No snow or ice meant that there were perfect conditions for PBs, and 50 runners did achieve a PB! No snow meant that Tim Crew, our Event Director, didn't wear his reindeer hat, a disappointment, but nevertheless, he and his brilliant team provided great support for the runners. 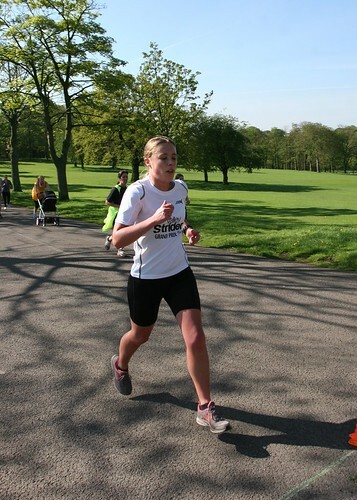 Jane Evans, a first timer to Roundhay was the first lady home with a time of 18: 39, just four seconds shy of the course record for female runners. Special mention to Sarah Flynn who achieved her ninth PB this week, Patricia Nolan who achieved a new PB with an age graded score of 71.2% and to all the others, too many to mention, who shaved a few seconds from their time. Runners were rewarded with a sweet on completion of a survey and crossing the finish line, thoughtfully marked PHEW! this week. The snow had gone but it was still a chilly morning on Saturday 2 February. ‘It’s the first time I’ve seen Graham in clothes –I mean long trousers,’ I overheard someone say. Nevertheless, 12 7 runners braved the cold to come to our favourite parkrun. We welcomed 3 new runners and a further 3 who were new to Roundhay. It was quite a good quite week for PBs. An honourable mention to Graham P (20:39) who will soon be entering the Men’s sub 20 minutes Hall of Fame. Congrats too to Ruth Small (27:09) who knocked 49 seconds from her last run this year and all those others who knocked those vital second from their time this week. Adam Hartley (19: 43) and Graham Needham of Valley Striders (20:07). First lady home was Sarah Graham of Morpeth Harriers (20:51) followed by Lucy Robins (24:56) and Jennifer Elvish (25:46) with a new PB too. Female course record holder is Charlotte Wills 18: 35. Finally, massive congratulations to the Temple Newsam squirrels on their first official run! Parkrun in Leeds just keeps getting better! Event Number 90 Run Report – We ran out of tokens! We were promised cold weather at the weekend and we got it, but luckily we had brilliant sunshine. This contributed to a brilliant parkrun aided by fantastic team of Volunteers who recorded our results, marshalled our course, acted as out pacers and cheered us on. Tom Williams from parkrun UK joined us too. Not only did we have a record number of runners – 250 , but also over 50 runners achieved a PB! Well done: a fantastic start to the New Year! We welcomed over 30 new runners together with a few visitors to Roundhay. Hope you enjoyed the run. First home was Mohamed Abshir with a new PB of 18.16, followed by Ben Butler. The first lady was Jenni Muston with a time of 21.43 followed by Sharon Woodruff with a PB of 22.02. There is a full list of results on the webpage. For a couple of runners, Jeremy Richardson and Adam Parton this was their 49th parkrun. Will it be 50 next week? There are a few others creeping up to the 50 club too. After the run there was a committee meeting at Napa and Graham Pawley stepped forward as the Volunteer Coordinator. Hurrah! The fact parkrun is a community event that is run entirely by volunteers is what makes it special. Mohamed ABSHIR (JM15-19) of Leeds City AC, was first over the line in 18:16 - first time in 3 appearances. Ben BUTLER (SM30-34) (Unattached) was second over the line in 18:57 - Was first to finish once before. Graham PAWLEY (Unattached) 3015 pts. Adam PARTON (Valley Striders AC) 2754 pts. Jeremy RICHARDSON (Unattached) 2110 pts. Jenni MUSTON (VW35-39) of Charnwood AC, was first (37th overall) over the line in 21:43 - 4th time in 6 appearances. Sharon WOODRUFF (VW35-39) of Abbey Runners Leeds, was second (43rd overall) over the line in 22:02. Jean SHOTTER (VW50-54) of Holmfirth Harriers AC, was third (63rd overall) over the line in 23:38. Bekki WHEATLEY (Chapel Allerton Road Runners) 2381 pts. Lindsay SHORT (Unattached) 2334 pts. Patricia Ann NOLAN (Unattached) 2284 pts. Andy HAUSER (VM55-59) was graded 75.65 % for the time 20:40 (23rd overall). Mohamed ABSHIR (JM15-19) was graded 75.00 % for the time 18:16 (first overall). Tim STRAUGHAN (VM45-49) was graded 73.85 % for the time 19:30 (4th overall). This week there were 250 runners, of whom 39 were first timers and 55 recorded new Personal Bests. Representatives of 21 different athletics clubs took part. Roundhay parkrun started on 23rd April 2011, and since then 2,324 different runners, including participants from 131 athletics clubs, have completed 11,091 runs covering a total distance of 55,455 km, and there have been 2,561 new Personal Bests. The Women's course record is held by Charlotte WILLS who ran in a time of 18:35 on 15th October 2011 (event number 24). The Men's course record is held by James SMITH who ran in a time of 15:34 on 19th November 2011 (event number 29). The Age Grade course record is held by James SMITH who recorded a 83.30 % run (15:34) on 19th November 2011 (event number 29). Today's full results and a complete event history can be found on the Roundhay parkrun Results Page. Roundhay parkrun Event #82 – It’s getting colder! In timely fashion it appeared on Friday that Winter was maybe about to arrive and that means the dreaded ice! I went down to the course late on Friday night to check and see if there was any icy patches and at 8 pm it was already - 1.5 and the hat and gloves were out! We try not to cancel runs the night before, just in case as happened, it warms up overnight and is safe to run. Myself, Ronnie, Ronnie Junior and Louisa were at the course before 8 am and it had rained overnight and the temperature was up, and thankfully there were only a few patches of ice and Ronnie set off with some salt and did his little bit for safety. its worthwhile to say that we have a proud record at Roundhay of only cancelling due to other events in the park as we love to run, but we would not hesitate to cancel, if we though that somebody may get hurt. This week we were blessed with brilliant numbers of Volunteers and after recent weeks where numbers had gone down, we are seeing the numbers rise again and we have a brilliant core group of hardy Volunteers. One of those Volunteers is Violet Gill and she was voted by the Core Team as the Volunteer of the Month for November and we are glad to have her on board. We locally produce a certificate to thank one Volunteer a Month as we feel that we should thank Volunteers as much as we do runners. I would have thought that there would be lower numbers due to the recent lower temperatures, but we had 152 hardly souls who wanted to have a run through the amazing Roundhay park and it continues our trend that has seen the run go from averaging 100, to around 150 odd a week since the Olympics. This week, I was Run Director, it had been a while since I had actually been RD, due the fact that we now have so many fab Run Directors who stand in at a moments notice and it means that we can all have time away from the run, or even just run! The usual Run Brief was given, and we make no apology for the length of the brief, especially when we have a number of new runners and the fact that safety might be an issue, and we know that a lot of you have come to enjoy the fun that we have. I was really happy to give Ed Halliday his 100 Club jacket, thanks to parkrun sponsors adidas, a brilliant achievement by Ed who seems to be around almost as much as our other favourite fellow and 100 Club Member, Graham Pawley. I was not surprised to hear that our Course Record Holder James Smith won by a country mile in 16.42, I ask him to try and set a new course record of 14.59, and I am sure that he will be back from some more, even better is that James has shown that even the fastest runners can also Volunteer at Roundhay and we are thankful to have him as a runner and Volunteer. Alas there was no John ‘The Headband’ Robson, who has more Top 5 places than I have ran at any parkrun, some say he waxes his head especially for his headband, all we know is that he is John Robson! Overall, you could see the effect of the Leeds Series as it was a tighter affair behind James, with the next four men separated by only 30 odd seconds. There were a few notable performance as ever and James Smith came in with the highest age grading of 77.84% and a brilliant run by Hetta Morath with 76.26% and I am sure that she will not mind us mentioning that she is in the 70 – 74 Age Category and still running 30 minutes for 5k! We also had our highest ever number of 100 Club Members running with 6 and also we had 6 50 Club Members as well and we have Carol and Adam Bull fast approaching the 100 Club and are both on 93 runs! Performance of the day though has got to go to little Oliver Renshaw, who I am told is 4 years old and completed the full 5k with his Dad in 40.32. What an amazing run and a pleasure for us to cheer him over the line after many others had gone home! Seeing runs like this makes you remember what it is all about and to see the face on children as they finish is brilliant. At the end we had the new and fab Tea and Coffee Team on hand to serve drinks to the now pretty cold runners and our thanks go to Bekki and Rachel and also to the David Young Academy for providing the equipment. Bekki will be doing this for at least the next 10 weeks and although it is FREE, she would be grateful for any spare pennies that you have that will go towards her fund raising for the Virgin Marathon 2013. James SMITH (SM30-34) of Leeds City AC, was first over the line in 16:42 - 6th time in 6 appearances. Peter HOPSON (SM25-29) (Unattached) was second over the line in 18:16. James WILKINSON (SM30-34) of Pudsey & Bramley AC, was third over the line in 18:26. Graham PAWLEY (Unattached) 2345 pts. Adam PARTON (Valley Striders AC) 2211 pts. Jeremy RICHARDSON (Unattached) 1802 pts. Nicky GREEN (VW40-44) of Barnsley AC, was first (11th overall) over the line in 20:24 - first appearance. Josie CRAM (SW20-24) of University of Leeds AC, was second (20th overall) over the line in 21:06. Liga MAGDALENOKA-KEEN (VW35-39) of Chapel Allerton Road Runners, was third (23rd overall) over the line in 21:34 - Has been first to finish on 7 previous occassions. Bekki WHEATLEY (Chapel Allerton Road Runners) 2288 pts. Patricia Ann NOLAN (Unattached) 1882 pts. Lindsay SHORT (Unattached) 1856 pts. James SMITH (SM30-34) was graded 77.84 % for the time 16:42 (first overall). Jim WHELDON (VM60-64) was graded 76.29 % for the time 21:01 (19th overall). Hetta MORATH (VW70-74) was graded 76.26 % for the time 30:11 (122nd overall). This week there were 152 runners, of whom 19 were first timers and 29 recorded new Personal Bests. Representatives of 19 different athletics clubs took part. Roundhay parkrun started on 23rd April 2011, and since then 2,139 different runners, including participants from 118 athletics clubs, have completed 9,964 runs covering a total distance of 49,820 km, and there have been 2,405 new Personal Bests. Please check Facebook, Twitter and this page for notices to see if the parkrun is cancelled due to inclement weather, we will normally not take the decision to cancel until early on Saturday morning and it is your responsibility to check. On 22 December we will be having our Christmas Run, please wear your Santa Suits and any other Christmas fancy dress, there will be prizes for the best dressed and I hear that there will be mince pies and the like as well! There will be a Christmas Day run on Tuesday 25 December and the time of the run is yet to be decided. It has not been decided whether there will be a New Years run, if you are able to Volunteer on either day, please let us know as we have to have at least 4 people to put a safe run on. Well it was a great running weekend that has now sadly passed us by. This week saw the running of the annual Abbey Dash in Leeds where 9000 runners bash along Kirkstall Road to the magnificent ruins of the 10th century Kirkstall Abbey. Then turn around and return triumphantly in front of Cuthbert Brodericks Victorian masterpiece Town Hall to big crowds and vocal support. It was great to see loads of Roundhay parkrunners there taking on the challenge, far too many to mention in this report but several met up afterwards for a deserved full English breakfast and maybe even an early doors ‘refreshment’ after the mornings efforts. It was great to see that the weather, although chilly, was perfect for running and it did seem to bring out the personal bests in people with big PB’s for many runners from the really quick guys to the ‘averagely’ quick so a huge Roundhay hug to all of you. It was a marked change to the weather that greeted us at that other Victorian master piece of Roundhay Park on the previous morning. It had rained on and off for most of the night but whilst putting out the cones and setting up the funnel the parkrun weather gods intervened and it dried up enough to make sure nobody was totally soaked. We had a huge bumper truck load of volunteers – mainly due to the Abbey Dash, not the inclement weather you understand – which made all the difference in running a lovely smooth event this week. Bekki Wheatley took up the Run Directors reigns again making sure everyone had a safe run and we handed out T-shirts to some juniors runners who had all gained their ‘10s’. Mike Mansfield joined us on his special ‘50’ day. He doesn’t quite qualify for his 50 T-shirt yet but his birthday did involve the number 50. He brought the whole family out for a run so hope he enjoyed his day. His son certainly tried to upstage him – but more on that later. 107 runners set off for 5000 metres of parkland running and it was clear that it was a good day to run as a lot of the quick runners had obviously booked the day off to rest up before the Abbey Dash. With a smaller field than we have had recently it was good chance to place highly and have a great run. John Robson flew out of the blocks and it was obvious from the first lap that he was going to be our first runner home, which was his target. He now joins James Smith and the legendary ‘unknown runner’ in having 5 first across the line parkrun’s under his belt. He was followed home by James Kilner and Joel Giddings respectively. Rav Panesar was 4th home and I will give him a brief mention since he was unlucky as he finished 1 second outside his PB time from last week. John and the others have a long way to go to the match the first across the line record holder at Roundhay, who again clicked the timer to be the first lady back this week to make it into double figures with 10 firsts at Roundhay. I am of course talking about Madeline Watson who notched another first over the line this week. Denise Ramsden was second lady home in a great new personal best time of 26:01 and third lady back was Harriet Frances Carlyle. We were joined this week by Antony Streams from Reading who has run 20 different parkruns in 20 weeks and this week he chose Roundhay to be his 20th. We hope he enjoyed the run and he has kindly agreed to be our interviewee for this month which will be published next week on this site. The previously mentioned Mansfield family were out running and young Ryan really had the bit between his teeth smashing 39 seconds from his previous best time and jumping from 26th to 7th for his previous best position as he rocked home in 21:06 before handing out the birthday cake. It’s just a terrible shame from him that his Dad moves into a new category and will have an ever increasing handicap % as Ryan’s is reduced now week on week! I feel a smackdown coming on! Great running though Ryan, really tremendous stuff. Thomas John Woodhead joined in the PB fun and games with a new low of 24:28 for him along with Anthony Stones who knocked out a new PB this week. BIIIIIIIIIIIIIIIG HUGS went to Ronnie Sam Bray who this week, 51 weeks after posting his last personal best in November 2011, finally went and beat it shaving a second off his old time. He and Papa were very happy and Junior posed with the ‘guns’ to celebrate! For the ladies it was a case of same again as Dawn Parton continued her charge down the times table with her 6th PB in 7 weeks this time knocking 22 seconds off her previous best down to 29:27 which considering her PB in September was a few seconds of 33 minutes is fantastic – well done to her. Huge congratulations to Anne Jones who this week broke through the 30 minute barrier to become a sub thirty runner for the first time at Roundhay with a new PB. Big well done to Maya Drinkall who last PB’d in January and this week shaved some more seconds off to get her PB. Finally before we leave this week and enter the world of the future a big Hey Hey to Hetta Morath who I am too modest to reveal her age category but she scored a huge 74% age grading this week in fact it was only out done by young Joe Sherman who came in 9th … yes 9th and in 21:15 and was a few hundredth of a seconds off a whopping 77% age grade. Well done to all, young and old that’s what we love about parkrun. If you ran the Abbey Dash on Sunday then this coming Saturday WEAR YOUR T-SHIRT! We want to see as many ‘Dash’ T-shirts as possible running on Saturday, of course if you have the time to volunteer that would be tremendous as well …. And still wear your T-Shirt! If you can give up your time meet at the bandstand at 08:20 everyone else we’ll see you just before 9AM at the start line.